You can view and edit all default settings in PMF by clicking Settings in the Manage tab to open the Settings menu, as shown in the following image. The Debugging panel is shown in the following image. After you make changes on the panel, click Save to save your changes. The following table lists and describes the default PMF settings you can view and change on the Debugging panel. Indicates whether the system should display the AJAX execution code before submitting the request. The default is OFF. OFF. Hides the trace window and shuts off debugging. Select OFF or ON to indicate whether WebFOCUS SQL Tracing should be active. The default is OFF. Select ON or ALL to debug PMF by turning WebFOCUS ECHOing on. ON displays FOCUS code for the last processing step. ALL displays FOCUS code for all processing and is not recommended. The default is OFF. Enable this feature to run compacted components for faster network performance. The Integration panel is shown in the following image. After you make changes on the panel, click Save to save your changes. The following table lists and describes the default PMF setting you can view and change on the Integration panel. Provide the WebFOCUS server user ID that is passed to ReportCaster for scheduled runs. Provide the URL for the iWay Service Manager Console. The Load panel is shown in the following image. After you make changes on the panel, click Save to save your changes. The following table lists and describes the default PMF settings you can view and change on the Load panel. Controls how PMF handles lower dimension level source data on load. Select E to display an error and stop the source load or W to complete the load and ignore the lower level data. The default value is E.
Controls how PMF handles higher dimension level source data on load. Select E to display an error and stop the source load or W to complete the load and ignore the higher level data. The default value is E.
The maximum number of lines to show in the Preview tab for Sources, Datapoints, Dimensions, and Measures. Controls if PMF should, by default, set all datapoints and measures to be recalculated when you click Load (or Generate) on a source, datapoint, dimension or measure during a session. This sets up the default when you create new objects. This setting can be overridden on many objects. Controls if PMF should, by default, set all datapoints and measures to be recalculated when a user enters data into a user-entered source. This sets up the default when you create new objects. This setting can be overridden on individual user-entered sources. Select Y to set values to zero for measure components missing at an intersection. This setting is the default. Select N to reject rows with missing components and allow them to be null. For example, if the actual of a measure is connected to a datapoint for which there is data, but its target data is missing, 0 will be inserted instead of not loading that intersection for the measure. If this is set to N, any missing components at an intersection cause all components to not be loaded. The Look panel is shown in the following image. After you make changes on the panel, click Save to save your changes. The Colors and Styles tab allows you to generate a color swatch for PMF, WebFOCUS content, and the WebFOCUS BI Portal, that give a consistent style to match the official style of your organization, or your group preferences. The following table lists and describes the default PMF swatch settings you can view and change in the Colors and Styles tab on the Look panel. Select one of the following default swatches for all PMF views. Set 01. Uses 10 point Sans-Serif font to provide good readability and compatibility with the ISO shapes, ISO signs, 3-D, and Few indicator sets. Set 02. Uses 8 point Sans-Serif font to provide much denser information on-screen (with slightly less readability) and is compatible with the Glass indicator set. Set 03. White, silver, black. Uses Set 01 specifications. Set 04. Black (Hitech). Uses Set 02 specifications. Set 05. Blue (Hitech). Uses Set 02 specifications. Set 06. Orange (Hitech). Uses Set 02 specifications. Set 07. Corporate blue. Uses Set 02 specifications. Set 08. Sporty 3D Blue. The default is Set 08. Set 09. Sporty Red & Black. Refers to the HTML backgrounds in PMF, such as those for panels, grids, and dashboards. Refers to the colors of text and borders in PMF. The following table lists and describes the default PMF settings you can view and change in the Advanced tab on the Look panel. Select one of the following default color palettes for charts. RYG_PASTELS to use a red-yellow-green pastel color scheme to describe performance on charts. The default is RYG_PASTELS. BLUES_GREYS to use gradations of blues to describe performance on charts. TANS_BROWNS to use gradations of tans to describe performance on charts. GREEN_N_TAN to use gradations of greens to describe performance on charts. Type the name of the default font style you want used in all views and grids. The default is ARIAL. If you specify a font and want to ensure the font is used for WebFOCUS PDF output, the font must be defined on the WebFOCUS Server in the PDF.FMP file. Type the name of the default font style for headings in all reports. The default is ARIAL. Select the thickness of on line charts. The available options are 1 (thin), 2 (medium), and 3 (thick). Provide the name of your company, organization, or enterprise (for display on some reports). Select the WebFOCUS stylesheet that will be used for all standard system reports. Select Y to use gradient colors on chart objects. Select N to flatten chart objects and not use gradients. Select one of the following indicator sets to display in views and grids in PMF. Using the same number elements will give you all of the essential designs, but you can also mix and match them to get a number of combinations. The PMF Labs panel is shown in the following image. After you make changes on the panel, click Save to save your changes. Note: This option is only seen if you enable the PMF Labs feature in System settings. The following table lists and describes the default PMF settings you can view and change on the PMF Labs panel. Analyze Source data on Load? Specify if an analysis of the source data will be run during source load. Set the time for scheduled or batch jobs to stop running when online entry and reporting starts. The time for when scheduled loads can begin. The Project panel is shown in the following image. After you make changes on the panel, click Save to save your changes. The following table lists and describes the default PMF setting you can view and change on the Project panel. N (No). The default is N (No). Project Dimension 1. Choose a specific Dimension for the first Project Dimension. Available Dimensions are listed, excluding Time and Project). Project Dimension Level 1. Choose a Dimension level for the first Project Dimension. Project Dimension 2. Choose a specific Dimension for the second Project Dimension. Available Dimensions are listed, excluding Time and Project). Project Dimension Level 2. Choose a Dimension level for the second Project Dimension. The Security panel is shown in the following image. After you make changes on the panel, click Save to save your changes. The following table lists and describes the default PMF settings you can view and change on the Security panel. G (Global). The default is G (Global). The Summarization panel is shown in the following image. After you make changes on the panel, click Save to save your changes. The following table lists and describes the default PMF settings you can view and change on the Summarization panel. Type the name of the Master File to use for external aggregation. R to pick up sorting from the report context. The default is R.
M to enforce the measure dimension order for sorting. Y (Yes). The default is Y.
Rebalance weights for no data? Select Y to rebalance weights to compensate for measure series with no data. The default is Y. Select the default dimension to be displayed in views. Choose a Dimension to use. Select the default dimension level for standard system reports. The available options are 1-Region, 2-Plant, and 3-Store. Select one of the following default time levels for displaying data when the time level is not specified. Quarter. The default is Quarter. The System panel is shown in the following image. After you make changes on the panel, click Save to save your changes. The following table lists and describes the default PMF settings you can view and change on the System panel. The amount of time (in seconds) PMF should wait for http server requests. The amount of days PMF will allow newer Feedback and Project information to be updated. The default value is 20 days. Hides legacy measures from appearing in the Measure trees on the Author and Manage tabs. 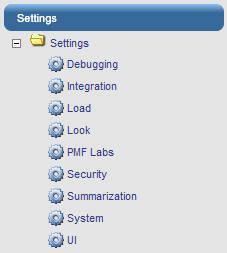 Enter the WebFOCUS Application Path used by PMF. Displays new and unsupported features from the PMF laboratory. Note: Enabling this feature is not recommended for production environments. Benchmark. A comparative average or median value for a business sector for displaying measures in reports. Forecast. A predictive alternate target or an estimate of future performance for displaying measures in reports. Stretch Target. An alternate target field for displaying measures in reports. Target. The default target field for displaying measures in reports. The default is Target. Note: You might see additional target fields, or different ones, depending on how your administrator has configured PMF at your site. Use system clock date. PMF uses the clock time and date on the server where your PMF application is running. Set to fixed time. PMF overrides the now date with the date you select from the drop-down menu below. This setting freezes PMF in time and does not allow PMF to slide as time elapses. This capability is best used for demonstrations of PMF when working with historical data and is not recommended for use in any other situation. Use custom procedure. You can modify a supplied procedure that calculates a custom date if the system clock date and fixed time options are not suited to your needs. Edit the procedure pmf_set_date.fex, which is located in your apps\mainstreet directory. Create three WebFOCUS Dialogue Manager variables: &TLVL01_CUR, &TLVL02_CUR, and &TLVL03_CUR. The UI panel is shown in the following image. After you make changes on the panel, click Save. The following table lists and describes the default PMF settings you can view and change on the UI panel. Specify how many seconds PMF should wait before auto-cancelling actions, such as a click on the dashboard, and drills. The default value is 5 seconds. Select Y to track project expenditures. A (All objects). The default is A (All objects). Select NEW or SAME to determine whether views open in a new window or the same window. The default is NEW. Select the number of significant decimal places to use for weighting. Choose 0, 1, or 2 decimal places. The default is 1. PMF has the ability to support English, Brazilian Portuguese, Catalan, Chinese, Dutch, French, German, Hebrew, Italian, Japanese, and Spanish for its user interface. You can switch PMF to display the user interface (panels, trees) and all report column titles and headings in any of these languages. There can be only one primary language configured for PMF at this time. If you change the user interface to display a language other than English, PMF runs a process to automatically change some internal data depending on the selected language. This data includes shipped versions of units of measure, content, dashboards, gadgets, time ranges, system settings, and functional roles. The internal information that is not automatically translated when the primary language is changed includes scorecard data, dimension data, user-entered data, and static components, such as Business Intelligence Dashboard (BID) tab titles and shipped documentation. You should select your desired language at installation time, otherwise you have to manually change BID tab titles when you change the PMF language. For documentation, you have to download and install non-English documentation for PMF. The primary language is stored as a setting in the PMF primary data mart. It is possible to connect the application to a data mart and have PMF automatically adopt the language configured there after an automatic metadata resync is performed (as long as the language configured is one PMF supports). If you want user interfaces and data display to be appropriate for the language you select, you should change the primary language of your WebFOCUS environment. The WebFOCUS primary language controls BID menus, WebFOCUS tools available from BID menus, and right-click menus in the PMF trees. For more information about changing the primary language for WebFOCUS, see the WebFOCUS Security and Administration manual, and the WebFOCUS and ReportCaster Installation and Configuration manual for your platform. Change the WebFOCUS server code page to display the correct character set for the target language. Verify that you have installed the appropriate language pack and that your user logons are configured to display the WebFOCUS user interface in the desired target language. You may have to change some server defaults, for example, CDN, to make the display of currency correct for the target language. Log on to PMF as an Administrator. Click the Settings panel button. On the UI panel, select one of the following two-character language codes from the Display Language drop-down menu. PMF automatically changes the internal language code and display items. You must log off PMF and then log on again to see the changes.